I get this Carl Zeiss Jena 135mm along with my Carl Zeiss Jena Sonnar 180mm f/2.8 and both lens are in M 42 mount and since I bought way too many lens, I can't afford to have time in testing each one thoroughly. I am afraid this good old popular Carl Zeiss glass will be sent to my friend before I can find time to take test pictures in the November rainy season of California. 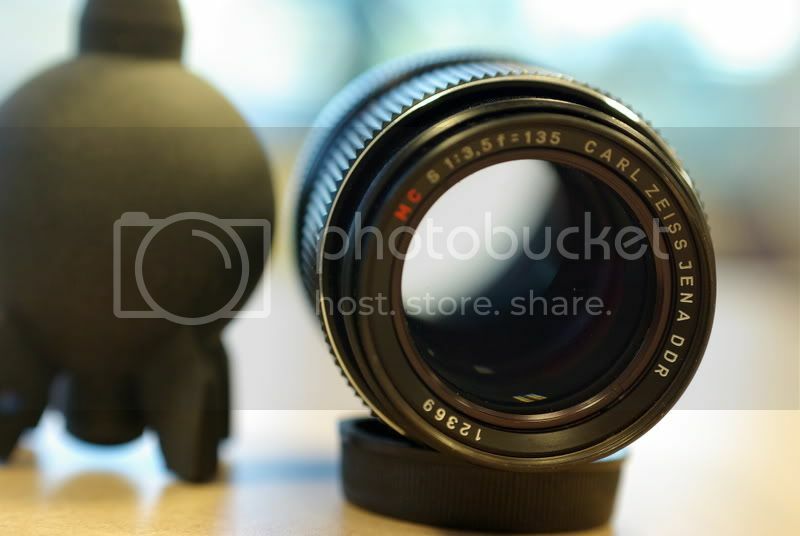 This Carl Zeiss 135mm f/3.5 looks very much like my Schneider 135mm f/3.5 (M42) in terms of size. And the Carl Zeiss glass comes with a built in lens hood which is nice. In terms of build, the Schnieder has a classic style and antique look to it whereas the Carl Zeiss has a more modern look. Both are made in Germany and known to produce great pictures with smooth bokeh and great contrast. Lens has a large base and that allows easy conversion from M42 to K mount lens with an altered adapter. Focusing ring is bit too stiff for me for manual focusing. Compared this lens to Schneider 135mm f/3.5 (M42), I much prefer the focusing in Schneider. But the focusing throw is close to 3/4 turn. Manual focusing can be a bit harder than the Schneider 135mm f/3.5. Bokeh, color, and contrast are excellent in this lens. It has similar IQ qualities to my Schneider 135mm f/3.5, also from Germany.